Over 40 years of golfing tradition! Originally founded in 1963 as Willowbrook Country Club, our club has an exciting history of golfing tradition in Southeast Huntsville. Some of golf's greatest and some very special celebrities have enjoyed all that Valley Hill Country Club has to offer. Join the likes of Lee Trevino, Tom Watson and Huntsville's own Stewart Cink and become part of Valley Hill history! It was announced prior to opening that Sam Byrd was tasked as the first Head Golf Professional of the newly built club. Sam Byrd played both Major League Baseball and professional golf. Before quitting baseball to pursue his golf career, Byrd played for the New York Yankees in the 1932 World Series along side Babe Ruth. Byrd was Babe Ruth's roommate and was nicknamed 'Babe Ruth's Legs' for pinch-hitting and late defensive purposes. Following his illustrious baseball career, Byrd then proceeded to win six events on the PGA Tour between 1942 and 1946. To date, he is still the only person to have played both in the World Series and golf's Masters Tournament. Sam Byrd was inducted into the Alabama Hall of Fame in 1974. 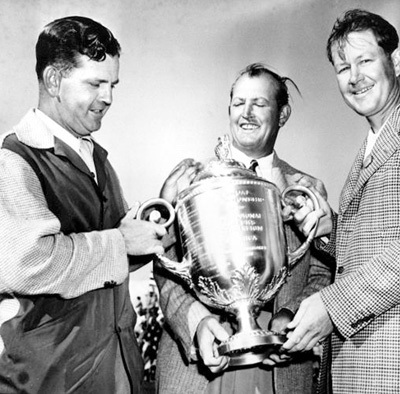 Sam Byrd and Bryon Nelson at the 1945 PGA Championship. Huntsville's most famous citizen was also heavily involved in early operations at the club. Dr. Wernher von Braun was a member of the 1st Board of Governors. Dr. von Braun regularly held business lunches at the club with NASA scientists, government officials, and of course, a few rumored astronauts. 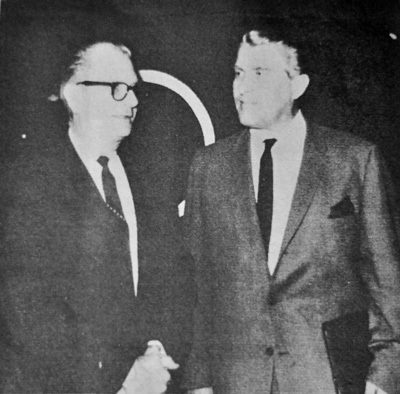 Members of Willowbrook's Board of Governors, Joseph Peters (l) and Dr. Wernher von Braun (r) at the club entrance. 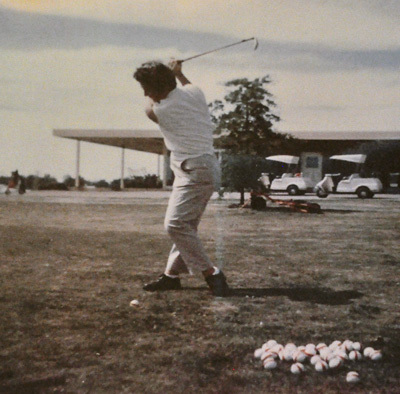 In the late 1960s, the Louise Suggs Golf Tournament was held at WCC. Louise Suggs won 58 professional golf tournaments, including 11 majors. She was one of the co-founders of the LPGA in 1950 along with Babe Zaharias and Patty Berg and as such, the LPGA Rookie of the Year is named after Suggs. Louise Suggs was inducted into the LPGA Hall of Fame in 1967 and the World Golf Hall of Fame in 1979. Louise Suggs at the WCC driving range. In the 1970's, Willowbrook Country Club officially became Valley Hill Country Club and the excitement continued with several Pro-Celebrity golf tournaments. Benefitting the Alabama Sherriff's Boys and Girls Ranches, the tournaments brought together several prominent PGA Tour winners and famous TV celebrities.